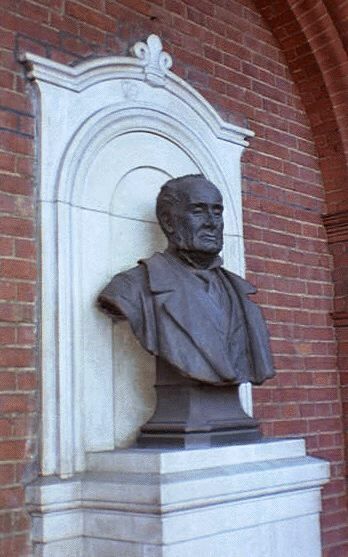 Sir Clements Markham: A house, a bust and a painting. Episode: 63. Site Numbers: 268, 269, 270. Update 17 March 2000. Date Posted: 7 June 1998. Location: London, UK. Type: House and Art. Sir Clements Markham (1830-1916), President of the Royal Geographical Society, was long Britain's great force in polar exploration. Almost alone he was responsible for reviving the idea of Antarctic exploration and worked tirelessly at persuading the British government to sponsor a major scientific and exploratory expedition to the Great South. The Societies' Expedition (National Antarctic Expedition or the 'Discovery' Expedition) was his great triumph. He championed Robert Scott as leader of the expedition, having long before in 1887 been impressed by the then-midshipman's victory in a boat race in St Kitts. The first London site associated with Markham is 21 Eccleston Square SW1 (268), his home of many years. Not far from Victoria Station, Number 21 is a five-story townhouse, white stuccoed like all its neighbors, overlooking the long narrow square. Back from the Antarctic, Scott "...found a welcome retreat at Markham's house...in which to write his narrative of the expedition", The Voyage of the Discovery. Markham was godfather to Scott's son, Peter, whose middle name was Markham. The last entry in Markham's diary, days before his death, reads: "Sturdy little Peter Scott came and walked with us in the Square garden." "This Monument to the Memory of | Sir Clements Markham | K.C.B. F.R.S., & for 12 years President | of the Royal Geographical Society | was erected in the year 1921 | by the Peruvian Nation | in Gratitude for his Services | as Historian of their Country." "The portrait of Clements Markham as an old man...symbolises these ruling passions. 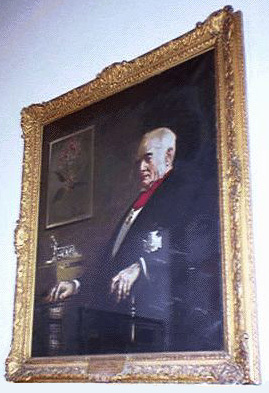 Above Markham's right hand is a framed picture of the Cinchona plant, which he collected in Peru for the relief of malaria in India. Below that, on a stand [made from oak from the Discovery], is painted a silver model of a loaded sledge and manhauling figure. This model was presented to Markham by the officers of the Discovery and Morning, when they all met again on 7 November 1904, in the Royal Albert Hall, to hear Captain R. F. Scott lecture on the National Antarctic Expedition of 1901 to 1904, of which he had been commander." This same statuette--which also appears in a photographic portrait of Markham opposite page 27 of Vol I of The Voyage of the Discovery--was in the Sotheby sale of 6 & 7 December 1984, and is illustrated in the catalogue. It's now in the collection of the National Maritime Museum at Greenwich. Another Markham title worth seeking out is Antarctic Obsession--A personal narrative of the origins of the British National Antarctic Expedition 1901-1904, edited and introduced by Clive Holland (Bluntisham Books/Erskine Press, 1986). Update 17 March 2000: Markham was born at Stillingfleet (447), Yorkshire, about 8 miles south of York. I wonder whether there's anything there of a commemorative nature.